Rinse the beans then put them in a bowl of cold water. After 10 minutes or so, run your hands through them to remove the clear-shells from the beans. This step isn't necessary but it helps with the creamy consistency. Drain the beans before starting the hummus. Easy!! 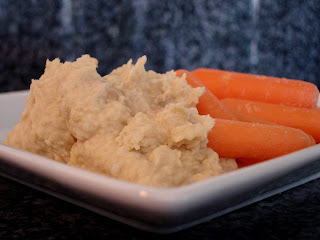 Many hummus recipes call for tahini or sesame oil, but I'm not a big fan of the flavor. Instead, I like the mixture of raw and roasted garlic with the garbanzo beans. Here is another variation on this recipe.